‘The cobblers kids go barefoot’…so do the horse trainers horses; both figuratively and literally. While we are still riding customers horses, like Jac, we decided that our own personal horses would need to go on the ‘back-burner’ for awhile. This move would save us about four hours of work per day. We arrived at this number because we had three personal horses that we were riding one hour per day plus cleaning the stalls, bedding and feeding. By pulling their shoes and moving them to run in sheds the labor of feeding and cleaning was drastically reduced and the riding was eliminated, for now. PLAN; By planning ahead we were able to save some money on the shoeing by skipping that completely. We were also able to see how we would accomplish the packing. SANITY; The ‘plan’ has kept us from feeling like we are slacking or behind. The decision was made instead of just running out of time, so we are being proactive. There is a huge difference. IMPACT; Deciding ahead of time also allowed us to talk about the possible problems. The horses won’t move forward in their training. This means that, in a way, they will be behind. This will impact each horse differently but by acknowledging this ahead of time we hope to decrease the chances that we will try to ‘make up’ for the time by riding them harder when we can ride them. The other side effect of this is that we really want to get the packing done so we can get back to riding our own horses. Who knows though, maybe some pasture play time and running around barefoot will have hidden benefits. The horses think they are on vacation….and maybe they really are. ← Where in the World are the Westfall’s? Hey Stacy, how old is Jac? I keep hearing people say that once you start training a horse you have to keep it up for so many days a week and then it is on going. I’m afraid I don’t agree. 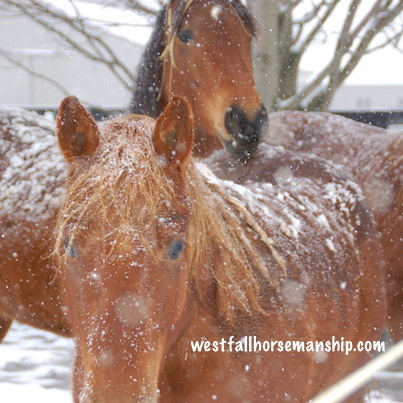 I had three very different horses that I raised from weanlings. Untouched babies. They were handled from the time I got them periodically but not excessively. Over time, a little bit of ground work was done like leading, sacking out, etc. etc. but once again, not on a consistent basis. Once training started in preparation for backing, sometimes I would not do any type of training for a whole week or even a whole two weeks and found that the horses always remembered what they learnt as if we never had a break. When I eventually had to sell them as 3 year olds as I was moving to Vancouver Island from Ontario, they were able to be ridden at walk trot and canter. All the new owners said they were the best horses that they ever purchased as I took my time, they were well adjusted and well behaved. They were a Breeding Stock Paint Mare, and a QH X and a Canadian X. geldings. The Cdn X we had to be more firm with our expectations but he was very clever and learnt very quickly. In fact, we had to start him younger than the other two to keep his mind active as he kept getting himself into mischief. He thrived on learning. So my point is, the breaks do work very very well. Good luck Stacy. Do all this while you are young. We don’t ride the girls here in the winter. So they get a long break, a little crazy in the Spring but it all works out. If it is suppose to happen it will. Good Luck in all your adventures love your work. 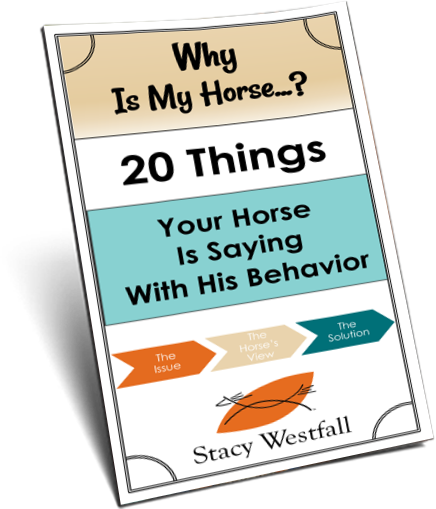 A really good horse trainer said to me once, after I complained that I felt terribly guilty about not riding my horse enough. “what is a horses natural past time? They like to walk, eat, poop, drink and play, they are happy wandering round a paddock with their mates” I don’t feel so guilty anymore 🙂 This theory does depend on whether the horse has a large space and some company. Stabled horses need exercise and stimulation. I also have bare foot horses so can appreciate the time and expense saved there. The horses always love and benefit from the time off. What you have tort them so far, gets time to soak in. It is just us, we miss out. Quality time with our own horses is good for the soul. Growing up in Ohio without an indoor arena my childhood horses took a vacation from trail riding and endurance racing every winter. None of them ever lost what they had learned. We only had to recondition them every spring. I was without a horse in my life for 16 years while my husband and children worked on their educations. Twenty years ago I got back into owning and riding but nothing competitive. 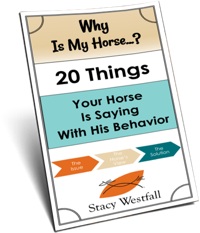 I had to board and folks at the stable insisted if I did not keep up a near daily riding regimen my horses would forget what they had learned. I knew better and let that advice go in one ear and out the other. The key is plenty of turnout time with 24/7 the best but 12 hours out doors works almost as well. Have fun in your travel adventures! I had pneumonia and had to do the same, almost 12 weeks, the horses did not seem affected except all of them seem more relaxed under saddle. One mare (who is always a little hard to catch ) actually is easier now. I do want to say that my Rocky MTN is awesome no matter how much time he has off. After our floods we had to take a proactive approach to how to make everything work since life changed drastically. Luckily our horses were already barefoot but we too had to decide to stop ride time to get everything else done in time for winter. Overall I feel like the benefits have out weighed the negatives to this. My horse has learned to play and is naturally tryin things I could not make him try so he has improved 100 fold. Plus we have our sanity so we are not as stressed and our work time is now flowing productively instead of full of frustrations. I think we are progressing faster than we were and even with the break of almost 3 months we seem to be where we want and need to be. Good luck with your move! Barefoot is GREAT! I’ve been a barefoot trimmer for seven years (www.KnowHoofKnowHorse.biz) and have seen dramatic improvements in horse’s comfort and attitude : ) If you’re looking for a great place to “land,” try the Black Hills of South Dakota. It’s a truly magical (sacred to the Lakota people) place and the prairie grass is the best food for horses. Check out the Wild Horse Sanctuary in Hot Springs, SD to see the “bloom” put on the horses by living in this spectacular place. Good…the horses really do need some ‘Horse’ time. Just like kids…they need a ‘Break’. My yearling’s (well, comin’ 2 now) training pretty much depends on the weather. (No indoor arena). Being I have quite awhile before I actually ride her, I have plenty of time so she gets a training period then extended vacation. One reason I love the NH methods is because they “stick”, especially with the young ones. I just pick up where I left off. With the racehorses, my father always liked to give them little vacations here and there. Mentally and physically they need it. Stacy, Where will your horses live if you are moving? We will bring them and board them. 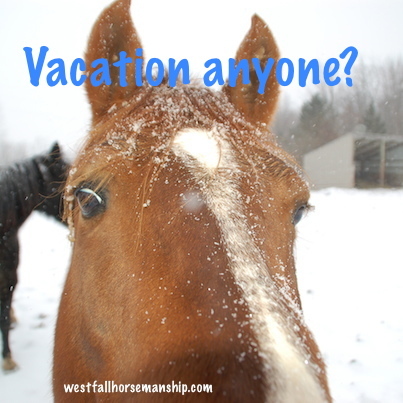 Personally, I think an occasional vacation is a good thing for any horse, just as it is for people. Heck, when you do find time to ride – don’t train! Just go for a trail ride or something. Then it’s a break for both of you! You are an amazing family. I hope your move goes smoothly. Again you have made the right decision. I so enjoy your daily blog Stacy! Let me know if you need help packing, cleaning stalls, etc.